The future development of society in a world with a population exceeding 7 billion people depends on Earth’s dynamic resources. The supply of accessible geothermal heat and future petroleum extraction are all controlled by the movement of fluids through faults and fractures in the Earth’s crust. Extraction and injection of fluids also perturbs the stress in the earth, which can induce earthquakes, form new flow pathways, and cause surface deformation. My research investigates the mechanical and hydrological properties of fractures, the stresses that cause them to remain closed, slip, or open, and the geological processes that heal them by forming new minerals. Thus, I study the conditions necessary to enhance and maintain permeability. This same understanding of fracture properties is critical to petroleum systems, contaminant transport, the formation of ore deposits, and earthquake hazards. 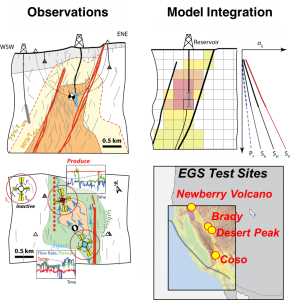 My research incorporates geomechanical analysis with insight from analytical and numerical simulations applied in concert with direct field/borehole observations to investigate how the physical properties (friction, earthquake behavior, and permeability) of fault zones arise from the processes that deform rock. Geothermal systems with active energy production provide particularly good natural laboratories which can be well characterized and which are subjected to strong, well-measured impulses from injection, production, and stimulation. Thus my research is primarily focused within the fields of geomechanics, in combination with borehole geophysics, quantitative brittle structural geology and geothermal systems. Research Philosophy: Geology is full of complex systems. In my research I try to find simple examples where I can isolate one or two key variables and test their control on a physical characteristic. These variables might include clay content in a fault zone, the distribution of rock types, the components of stress resolved on a fracture, the geometry of a fault system, or the initial porosity of a rock. Simplicity is key in science. Geomechanics involves the integrated analysis of stress, strain, and displacement fields. The relationship between stress and displacements is mediated by the physical mechanisms that allow rock to change shape. These mechanisms result in the structures we map in the field.